The Guardian never misses an opportunity to publish one-sided articles about what it perceives as abuses Arabs living on the West Bank suffer at the hands of Israelis. Although the mindless Harriet Sherwood has picked up the baton, one of her predecessors was Chris McGreal, now the Guardian’s Washington correspondent. McGreal was responsible for the fabrications the Guardian has repeated whenever an opportunity arose that Israel provided the apartheid-era South African government with nuclear weapons. He still contributes to negative articles about Israel from his desk in Washington. Oddly enough, McGreal seems to have missed the following fascinating story occurring a few blocks from his office in Washington – one he would never overlook, I am sure, if any of the actors were Israelis. 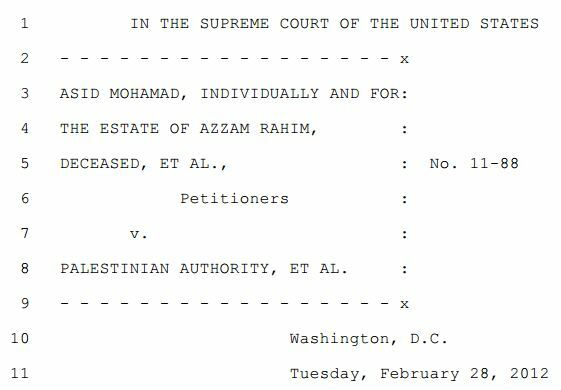 The Supreme Court of the United States has been asked to rule on a request for damages in a human rights case brought before it by the family of a naturalized US citizen tortured and murdered by representatives of the Palestinian Authority and the PLO on the West Bank. Azzam Rahim was born on the West Bank. He emigrated to the US in the 1970s and became a naturalized US citizen. After the Oslo accords were signed in 1993 he would periodically revisit the village where he was born, only to become yet another victim of those accords. According to his family, Rahim was with his 20-year old son Shahid in a café in his village in 1995 when he was taken away by a group of four men who represented themselves as Palestinian policemen. According to his son, they were PA intelligence officers. Whatever their true motives, Shahid has said that they claimed that they wanted Rahim to identify some stolen jewelry. Two days later Rahim’s body was returned after he died in their custody in Jericho. The report of his torture and death was confirmed by the US Department of State. “The first thing I saw was cigarette burns all over his body,” Shahid says. “The bottom of his feet, his chest, his stomach, his hands.” His face and body were badly bruised, and his ribs broken. Three intelligence officers were sentenced for their role in the case. Two were sentenced to one-year terms and one for seven years. Rather light terms for torture and murder by any standard. The family has sued the Palestinian Authority and the PLO for damages under the “Torture Victim Protection Act of 1991” (TVPA). However, lawyers for the PA and PLO have used a quirk of the law to defend their clients against the charges. The Act refers only to “individuals” –i.e., “natural persons”. Therefore, they argue, it cannot be applied to organizations such as the Palestinian Authority and the PLO. The family’s suit was dismissed by a lower court on those grounds, and they have appealed to the Supreme Court. “Sec. 2. Establishment of civil action. “(2) subjects an individual to extrajudicial killing shall, in a civil action, be liable for damages to the individual’s legal representative, or to any person who may be a claimant in an action for wrongful death. Though TVPA § 2(a) refers to an action against “[a]n individual,” district courts in the Eleventh Circuit, and the Eleventh Circuit itself have explicitly held that a TVPA action may be brought against organizational defendants. If this were not the case, damages could be limited, in this case as an example, to what a PA police or intelligence officer could pay rather than the damages that could be extracted from the organization that employs him and that he holds himself out to represent. One can only imagine how McGreal, Sherwood, and the Guardian would have pounced on an issue like this had it involved Israelis. We have seen them printing article after article about a terrorist’s hunger strike as an example of Israeli “brutality”, yet clear torture and murder by the PA and PLO seems to go unnoticed. The journalists’ anti-Israeli omerta (code of silence) against Palestinian misdeeds will continue to be scrupulously observed by the Guardian and its representatives (and other MSM journalists with an anti-Israeli agenda) to preserve access to stories, real or fictional, in the West Bank, Gaza, or Israel that can be used to blacken Israel’s name, as Stephanie Gutmann pointed out in her book “The Other War”. The same thing happened to me in Ramallah but I was lucky I’m a American who is married to a Israeli and they didn’t dare try to torture me!It also help’s if your Jewish. I was just reading your latest CIF article with interest. I took a seminar/clinical course about reparations and the like in law school. There is a very fine point of law here. A corporation can be characterized as a person and therefore an individual, but it is not clear whether a government is the same as a corporation. I have been reading the brief and they do not seem to address this question. All of the ATS/TVPA cases they site refer to corporations and other cases filed under the ATS normally refer directly to government actors (I did a little research, someone once sued the former Bolivian prime minister and defense ministers, but not the government of Bolivia). If you read through the primer in the website above you will see that governments have not been held accountable. It is very hard to sue a foreign government under a United States tort statute. What usually happens is that the United Nations would have to set up a tribunal in (or regarding) the foreign nation in which the atrocity/genocide/torturous activity took place (See Rwanda, Khmer Rouge, Guatemala, etc.). Then the person or legal representative of the person who was wronged can seek redress directly against the government in question. Foreign governments can and do claim Sovereign Immunity under the Foreign Sovereign Immunity Act, 28 USC §§ 1330, 1332, 1391(f), 1441(d), and 1602-1611. As a result of this case and another that was presented on the same day dealing with atrocities in Nigeria, there is already a suggestion that the law needs to be amended to make it clear that the purpose is redress of grievances by an individual, organization, or country. From reports of the judges’ questioning, specially apparently Scalia, it seems likely that the Supreme Court will not grant damages to the family on the basis of the word “individual”. However, they may only have to take that path unwillingly, since it is clear that some damages should be awarded, and this technicality in the wording of the law is preventing it. Yes – it is hard to drag a country into court, but with sufficient diplomatic and financial pressure you may recall Gaddafi had to pay up to the families of the Lockerbie bombing. Apart from that, the other point I would like to emphasize is that if the case had involved accusations of Israelis or Israel or Israeli organizations being sued before the Supreme Court, the Guardian would have a half-dozen articles about it already up on its website. I was merely commenting on the legal aspect. In the oral arguments all of the Justices, not just Scalia, were pointing out the absurdity of trying to expand the word individual beyond its bounds. The discussion of the legislative record suggests that Congress did not consider including foreign powers within the jurisdiction of the statute. From a political aspect you are certainly correct. Luckily, United States courts do not go out of their way to hold foreign powers accountable unlike courts in Spain or England have done. Unfortunately, the Guardian would never report such a use of judicial restraint as it ruins their preferred story line. Thanks for your interesting comments, Sabra and Akus. It is refreshing to see two people having a sensible and calm debate about issues of international law without the silly name-calling that usually ensues in similar on-line debates. I have a genuine question for you. Even if the Act was amended to enable torture victims to bring governments to court for damages, do you think this would cover the PA, given that it is not a “foreign government” of an independent country as such? The PA may not be a nation-state, however, under the 1992 Oslo Accords it is the organization, recognized by Israel and other nations, as the representative and administrator of the territories. For the moment I am ignoring any discussions about Gaza and their “government”. They were the recognized political and police controlling regime of the West Bank when the torture took place in 1995. Under the UN (if you want to bother using it as a barometer) the PA/PLO is a non-state entity with observer status. So at worst, they are a very large “NGO” and therefore akin to a corporation and not a government. The status of the PA lies somewhere in between. The law would need to be amended to include governments, corporations, and various other forms of unincorporated organizations if we would like to address foreign organizational actions such as torture in US jurisdictions. The problem here, as noted by the Justices in the oral arguments, is one of appropriateness. Congress, based on the law they passed and the legislative record, decided that it was inappropriate for a US court to claim jurisdiction or liability over a foreign power. However, Congress did decide that it was appropriate to hold individual actors from those governments liable. This is in-line with other US policy decisions over the years including not being a part of the ICC. The problem in this particular case is that the individual governmental actors do not have deep pockets. The family, who are completely justified in seeking redress, are going after the PA/PLO because it has money. The policemen do not.